Fantastic pizza. Beautiful, clean restaurant with really friendly staff. They also give a 10% senior discount. I highly recommend this restaurant. Excellent service and so kind to open up the kitchen for a last minute order. Such service is rarely found in other restaurants. Oh my God!!!!!! Our office found this place and finally there is a decent place for lunch around her. The chicken wings were the best I ever had!!!!! We have gotten pizza, sandwiches her also and everything was very good. Ordered eggplant parm hero and garlic bread with cheese. All I can say is that was probably the best I've had in a long time. Food was even delivered 15 minutes EARLY! Will definetly be ordering again! Buongusto is an unassuming Italian restaurant found in a little strip mall. It really doesn't look like much -- you won't find any Michelin rated restaurants in a strip mall -- but it's AMAZING! My girlfriend and I only visited because she found a $25 off of $50 coupon from restaurant.com. Good decision! Seriously, I was a little nervous when I walked in because it looks like such a mom and pop shop, and it doesn't help that many restaurants which advertise on these types of sites (like Groupon) are discounted for a reason. All nervousness was alleviated when the food came out, though! We ordered an appetizer of buffalo wings (hot; $8.95), eggplant parm ($14.95), penne vodka with shrimp ($15.95); and we got cheesecake ($4.95) and coppa stracciatella ($5.95) for dessert. Total was $54.24 for two, which is great because we ended up bringing the meals home so we got four meals out of one trip! My penne vodka was great! Creamy but not too rich, the pasta was cooked well (just a little over al dente, which I like) and the shrimp was fresh. You get a decent amount of shrimp - I think around 7 jumbo pieces. It was also a huge plate, too, which I didn't expect. And for whatever reason you also get a pretty flower on top, so that's nice if you enjoy mixing pasta with flowers. In keeping with the theme of big plates, the eggplant parm was the BIGGEST plate of eggplant parm I've literally seen in my life. Seriously, too big. Way too big. I mean, it's a great thing, but just shockingly big. My girlfriend really enjoyed it. The wings and dessert were also good, but nothing amazing. Just hot enough, I think the wings were freshly breaded in house (as opposed to just frozen wings being thrown into the oven). I'm assuming this is the case because the food took FOREVER to arrive at the table. The wings also tasted... different. But not bad different. Just... fresher? The cheesecake was fine, but not great, and the coppa stracciatella was waaaay better. It's billed as gelato, but after having just visited Italy and eating gelato everyday, I'm fairly confident it was just regular American ice cream (which isn't bad!). First time here and love it. I had the chicken Sorentino dinner with a side of Penne Arrabiata...full of flavor, delicate and just right. The place is nice, bright and clean. The plates are well garnished and generously sized. The staff is friendly and attentive and, yes, Manuealla is all smiles. The owners are very hospitable and generous. Will definitely come back with friends, family and colleagues. I can't say enough good things about this place. We have repeatedly ordered and have never been disappointed. I highly recommend the grilled calamari and shrimp salad, it's amazing. Definitely give them a try, I doubt you'll be disappointed. Great food and large portions. Service is amazing. My waitress was Manuela. Attentive on point and friendly. My favorite wings , arugula pizza with balsamic dressing. Great place to stop for lunch/dinner. Over 15 different types of pizza to choose from. Highly recommend the chicken gorgonzola salad. Great staff/service. This restaurant is authentically Italian! The new decor is gorgeous, the staff is terrific, (particularly, our waitress, "Rose." She was great!) ....and the food was outrageous!! We had pizza, which was thin and crispy: Penne Vodka, which was extremely yummy; and Baked Ziti, which was also a big "hit!" Finally, we ended this fantastic meal with a free piece of delicious cheesecake, thanks to the restaurant's free coupon posted on "Yelp!" WOW!! THIS PLACE IS THE BEST!! The food was so delicious. Best Italian restaurant in the area. The portions were really big compared to the price. Staff is so friendly too. Not to mention the tasty desserts. My favorite was the cream brûlée! Excellent food! The menu has many choices. Portions are huge and Prices are terrific! Marina is a fantastic server! Entire staff was very friendly. Will definitely go back! Been here a couple of times and the food is great. My wife is raving about the arugula pizza and the chicken francese was delicious - and the portion was huge. New place that deserves a try! This Italian restaurant is by far one of the best restaurants in Wayne. I had the chicken Franchise and it was delicious. They also have a very good pizza selection. The staff was very nice and helpful, they made sure that I was very satisfied and that the food came out to my satisfaction. I will definitely go back there again. Thank you very much buongusto. I love the food here. Salads are huge and delicious. Gorgonzola salad, grilled shrimp and calamari salads are my fave. Amazing mozzarella sticks. Today I'm trying their pizza and will update this post. I've been ordering from here like every other day and delivery is fast too. Great food, great service! Very authentic Italian food, reasonable prices. Will be coming back soon! Best garlic knots my family and I have ever had. And we came in one night as they were closing, the owner (I assume) was super nice, found us some garlic knots, and found some cheese slices they hadn't sold. He even gave us some free slices on top of what we'd ordered! Excellent food and great people. 1st of all they make chicken francese and it is GREATTTT i mean everything we have ordered is great we just ordered again and i think im addicted! At first i thought it was just a little bit pricey but when we got it 1. The quality was... idk how to put it if anyone has watched ratatui the movie its like when the guy in the end eats the food and remembers his childhood lol and the quantity.. look I'm a very large man and i didn't get to become this big by not finishing my plates and to say that the food was/is that good and that i wasn't able to finish it u know dam well it was a lot lol. Anyway i give this place all the stars in the galaxy because they deserve it! Great experience. Went with my family. We started with the Buffalo wings, they were perfect. The wings were not over powered and tasted just right. I had the chicken masala with vegetables and I would definitely recommend it. Both the owner and the manager were both present. They were constantly walking around asking if we needed anything. Definitely know what they are doing. Asked our waitress, who was very helpful and delightful, she said they are always present. They work open to close. The place was also easy to find and very clean. Don't even get me started on how good the desserts were. This family restaurant absolutely won me over as a regular. After leaving a meeting late one recent evening, my wife and I were hungry. We decided that we wanted Pizza. But I couldn't think of a place that might be open past 9 p.m. As we drove, I spotted BUONGUSTO! The lights were on, the neon sign read open, and there were people inside! We headed over and sure enough they were still open and serving. When we entered we were greeted, enthusiastically, by one of the counter guys. He offered us a table and we sat. The decor is modern yet classic. The large dining area is well-lit by very nice hanging light fixtures. The chairs are very comfortable and the tableware gives the feeling of a much more expensive restaurant. There are several large flat screen TVs on the walls to entertain those that might be dining alone. All of the screens are muted which makes conversation for groups comfortable. The selection of pizzas was stunning and all looked delicious. I went with an old favorite, buffalo chicken. The slice did not disappoint! It was a satisfying size, had a medium thick crust that was cooked well enough to support itself when folded & had chicken in every last bite. Not to mention that the flavor was on target. It had just the right balance of cheese & sauce that did not overwhelm. When my wife looked at the menu she changed her mind about pizza. She went with an antipasto salad. The salad was large, fresh and contained every ingredient that are real antipasto salad should have in it. The stars on the plate where the fresh mozzarella and roasted peppers. We were definitely satisfied and know that we will return to this new eatery to try other items on their menu. We highly recommend a visit! My Favorite Pizza in Jersey!!!!! Such friendly owners!! They put love into their pizza!!! and amazing cannolis!! New pizzeria close to my job that is way way more than just your average pizzeria. We've been there a few times and everything taste amazing very homemade soups the Panini's and the pizza is so good. By far the best Zeppoli's I've ever had and I was born and raised in New Jersey. The BEST pizza I've ever had. Great staff , warming atmosphere. Never will I go to another pizzeria! Just open at West belt plaza in the willow brook mall next to a Chinese restaurant , and right outside the AMC movie theatre. I went there to try this new Italian and pizza restaurant. Well the slices were very tasty crunchy and thin slices . I set my eyes on the chicken bacon ranch, and my taste buds were in heaven. Really love it! their menu is very extensive, service was very professional and friendly. F. took great care of us , I definitely recommend this place. Awesome place,awesome pizza and awesome dessert!5*really friendly staff! Nice and clean restaurant! This is such a great restaurant and the food is amazing! And our waitress Rosemary was so sweet and kept us updated on the status of our food. If you are craving a good meal with great service and environment this is your stop. My wife heard of the reviews so we had to check it out. The food was fabulous and needs a 5 star review. Pizza and buffalo bites appetizer was great. My fettuccine Alfredo with chicken was cooked to perfection and a nice flower in center for show. My wife had a salad with grilled shrimp and she loved it with the lemon vinaigrette dressing. Very surprised with the quality of the food and the flavors. We definitely will return soon. You have to try this place. Best freaking shrimp and calamari salad EVER! The service was great, their online ordering system was user-friendly, and their delivery was timely. 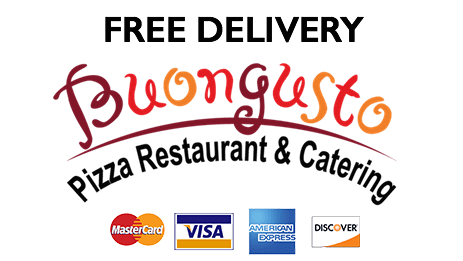 I've ordered pizza, pasta, and salads from this location and it all has been AMAZING! Thank you. Personal Arugula pizza with extra mushrooms, olives and artichoke hearts. Just great! This place has some of the best pizza I have ever had. The margarita pizza was amazing. Chicken, bacon, ranch was also very good. Looking forward to trying more of the menu. Owner was very nice. Personally gave me advice on pizza types to try. Great quality. Friendly service. I had the soup, salad, and garlic bread. All extremely good! Highly recommended. Skip the mall food, and eat here instead! What a great little spot! Friendly service and conveniently location near the Wayne AMC and Willowbook mall. Portions are large and the Italian food is superb. I came here for lunch with a couple friends and had a $25 off $50 restaurant.com coupon. We all got entrees and one appetizer and we had leftovers to take home. I ordered the veal parmesan which was well breaded and excellently cooked and it came with two sides. Overall, clean, friendly establishment with great food and good service. Large portions and a great deal on restaurant.com makes this place 5 stars. This was the best pizza I've had in awhile. The crust is so nice and thin. I had the chicken bacon ranch and I loved it so much. It's also really beautiful inside and the workers were so sweet. Also something cool I noticed is that their delivery is free. I definitely recommend! 1) I got the spaghetti with meat sauce and side of meatballs. 2) The food was fantastic and fresh. 3) Love the variety of free bread they provide.